Dani and husband Bobby were basking in an entirely new level of joy. Roughly 20 minutes into their time as a new family, the calm was pierced by shouting from the doctor. SPOKANE, Wash. — Women in the United States are more likely to die from pregnancy-related complications than in nearly any other developed country in the world. For each mom who dies, there are 100 women who experience potentially deadly complications. Which is why when choosing where to give birth, you need to ask your hospital if they have specific protocols in place to save your life if you have a complication. When Dani Hopkins delivered her first child, it was easier than she'd imagined. 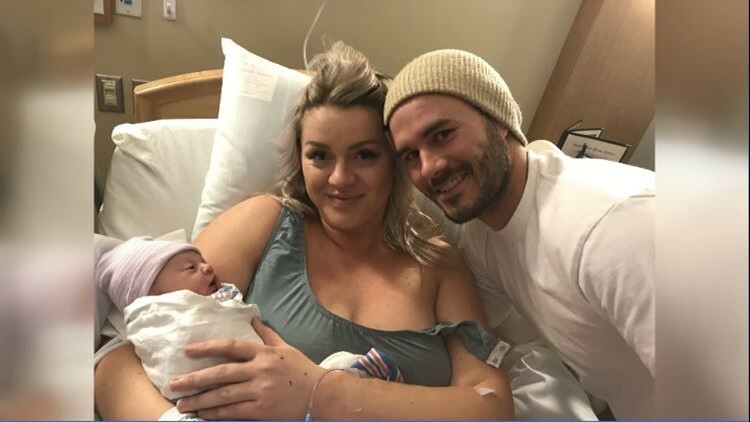 Six hours after her first contraction at home, daughter Taylor was in her arms at the hospital. Dani and husband Bobby were basking in an entirely new level of joy. Roughly 20 minutes into their time as a new family, the calm was pierced by shouting from the doctor. "She's bleeding out. And almost immediately there were like eight to 10 people in there. The doctor's yelling all these acronyms like I need a this, this, this, and a this, this, this. And people are running in and out of the room yelling things back at him and he's yelling things at them. And I just see like sponges and sponges of blood coming out. I just remember thinking if I get too excited my blood will pump faster and come out of me faster, so I was just like I need to stay calm," Dani said. As the minutes ticked by Dani knew she was falling deeper into trouble. "I just remember looking down there and seeing him stitch and then he would release the clamps and say, 'That wasn't it I can't find the source of the bleed. She's still bleeding,'" she explained. For about an hour and a half, Dani's doctor frantically tried to find the source of the hemorrhage. "I remember thinking, ‘Oh this is how I'm going to go’ and I was just so calm and I just remember thinking how sad I was that I wouldn't get to see her grow up and I thought he may have to be alone," she said. "Blood loss during delivery can happen very rapidly and it can be catastrophic," said Dr. Lacey Marks with Multicare Rockwood in Spokane. Marks is not Dani’s doctor. Dani's story is a good example of why expectant parents should always make certain their hospital has a protocol in case of hemorrhage, which is the leading cause of pregnancy-related death. "A lot of causes of maternal death in this nation are due to hemorrhage despite the fact that we have tons of medication. We have a blood bank," Marks said. Marks' hospital at Multicare Deaconess does have protocols in place to in case a women hemorrhages. But don't assume that's the case at all hospitals. "I worked at another hospital in the past. I had a woman who was hemorrhaging, and I was new to that hospital and I said, 'Okay, call the blood bank and activate the massive transfusion protocol'. And the anesthesiologist said to me, 'What's that?'. And I was like, ‘Oh. Okay.’ And that came as a shock to me. That hospital now has a protocol," Marks explained. Fortunately, Dani's hospital did have a protocol to deal with her blood loss, but it had never occurred to her to ask before she needed it. "No, we didn't check that. No. I literally never once thought that I could lose a lot of blood. No,” Dani said. Part of a hospitals hemorrhage protocol should include measuring a patient's blood loss. "It used to be that the doc would look around and say, 'Ah, it looks like a liter', you know. Now we have protocols to actually collect all of the blood lost and quantify and weigh it and we'll know exactly how much," Marks said. "I was lucky to be in the right place because I didn't know to ask these questions. So, I think number one this is great that it's being brought up and that people know that it's a thing that can happen, hemorrhaging," Dani explained. In the end, Dani lost blood for close to two hours. More than 100 internal stitches finally stopped her bleeding. "It was all internal. And so, there were just a bunch of lacerations internally," Dani explained. “Their explanation is everyone's anatomy is different and just maybe the way she came out and my anatomy didn't match up." Recovery is slow, painful and a bit emotional too. "He (her husband) changes her diaper, he picks her up and brings her to me because I just have a hard time getting up and around and it's just been frustrating as a new mom to not be able to do anything," Dani said. Fortunately, the antidote for her frustration is never far away coming in the form of this 7-pound superpower of cute. "Just her face like fixes everything. And I love it so much. I just feel so happy that I get to be here to see everything," she said. While Dani and Bobby are laser-focused on Baby Taylor, they also need to be hyper-aware of Dani's health too. Thirty-three percent of maternal deaths happen after delivery, according to Marks. That's why the American College of Obstetricians and Gynecologists is recommending new guidelines to cut the time before Mom's first post-partum check-up from the now standard six weeks down to three. The maternal mortality rate nationwide is 26.4 deaths per 100,000 live births. In Washington, where there is a maternal mortality review committee, the rate is 13.8. In Idaho, which does not have a review committee, the rate is 23.78.